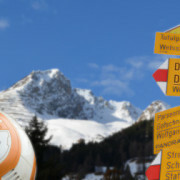 Each January, Europe’s highest town, Davos, becomes a hive of activity as it hosts the World Economic Forum. Differences like this sometimes provoke debate about which of the pronunciations is ‘right’. In this case they’re both wide of the mark. In German, Davos is stressed on the second syllable, not the first, and this contains the long German vowel oː. Forvo currently has this clip contributed by a German speaker. As I explained in this article, German oː resembles the BrE THOUGHT/NORTH vowel. 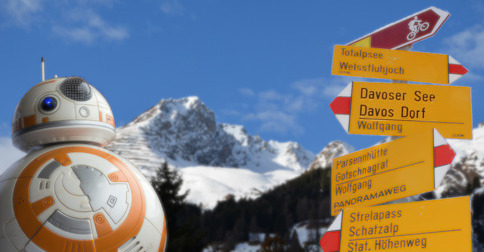 German v may be pronounced f, so English people would actually get a little closer to a German version of Davos if they pronounced it more like da Force. A paper I published over 25 years ago explores the different treatment of loan words by AmE and BrE. AmE has developed a tendency to pronounce written a, e, i, o, u with the vowels of PALM, FACE, FLEECE, GOAT, GOOSE in the stressed syllables of loans. BrE is rather less consistent, eg Davos with TRAP and Java with PALM. It’s not strictly correct to claim that the words of one language contain the phonemes of another. And German Davos does not contain the əʊ or əw diphthong of BrE no. The oː of BrE north, while not a German vowel, is more similar.